Supermarket price squeezes may give you cheaper veg - but it comes at a price eventually! Sadly as usual it's not the growers who make a big profit but the supermarkets who cynically seem to think they can charge what they like for organic produce. Although some discounters such as Aldi are stocking more organic produce now - especially in Germany - unfortunately in many cases supermarkets are squeezing what they pay to growers in order to keep their prices artificially low. If supermarkets squeeze grower's prices too much - they will go under as many have done already. This means that the fewer growers that are left even are even more vulnerable to the bullying of the supermarkets - and that can then leave us with less choice too! I spent many years as a commercial organic grower and I know just how tough it is - particularly when supermarkets only want sizes and shapes to fit their stipulations for packaging. What makes life even more difficult for growers is that it is standard practice to pay producers a minimum of three months AFTER you have supplied your produce! Supermarket packaging requirements also generate a huge amount of food waste. I used to end up with at least a third of my cucumbers either just a bit too long or just a bit too curvy for their ridiculous criteria - which naturally only refer to cosmetic appearance and packaging convenience for them! My answer to that was to establish the first ever organic box scheme in Dublin - back in the early 1980's. Although it was incredibly hard work and very time consuming - one of the really great things about doing it was that it gave me the chance to really inform people about the benefits of organic food on a one-to-one basis and to answer any questions. I could explain why organic is not just better for us - but also for the environment and for biodiversity too. Many of my original customers are still my friends now after over 30 years - and all are still committed organic consumers despite the fact that I no longer supply them, having stpped grwoing commercially in the mid 1990s. Buying produce direct from a local grower or farmer's market is also a really nice thing to do as a consumer. It's fresher and often cheaper as you're cutting out the middle man - and the growers make more too as they're not being squeezed by greedy supermarkets and they get paid immediately. But don't forget that they're very busy people who work long hours - and much as they would love to chat all day they really don't have time! Although obviously things that can't be grown here or in the UK have to be imported - shopping locally, seasonally and organic is the very best way, as this supports a cleaner environment and biodiversity in your own neighbourhood! A win/win for everybody - except the supermarkets! I'm really thrilled with the perennial 'Glin Castle' kale I was given by some friends a couple of years ago. Not only is it seemingly impervious to almost every known pest and disease - but it's productive, delicious, hardy and incredibly easy to propagate from cuttings! It just wants to grow and I love plants like that! What an absolute paragon of a vegetable! I'm now looking forward to kale forevermore - without any trouble - and I'm all for doing less work! Considering that kale is one of the healthiest vegetables you can eat - what could possibly be better? Mandy Barbour at Incredible Vegetables has similar varieties but I know she has a waiting list since an article on perennial kales in one of the national newspapers. My friends didn't know where this kale originally came from - but apparently it was brought to Glin Castle (former home of The late Knight of Glin) by one of the cooks, from her village. I'm not sure if it is the same variety as the Daubenton Kale which came from France originally. It would be interesting to compare them. The history of vegetables is fascinating, because it doesn't just embrace gardening and culinary history - but also social history as well, since many of the useful vegetables we eat today traveled with various peoples from many lands all around the world. 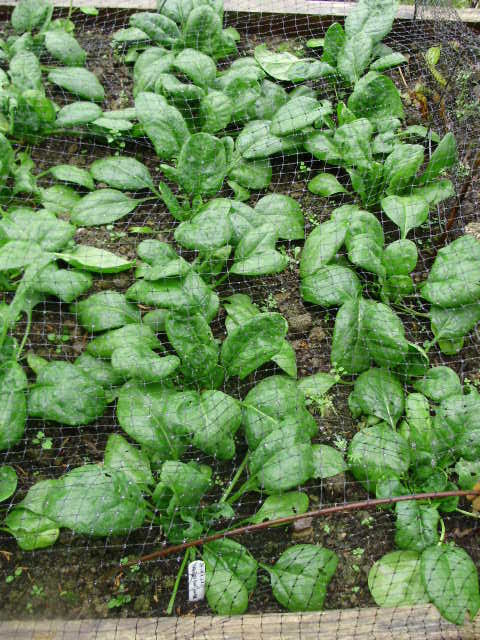 It's been mostly a mild autumn up until recently that my second year of 'late crop' autumn spinach trial in the north east bed outside in the veg garden has been a great success again. All three of the varieties are continuing to grow and crop really well. The varieties I've grow are Matador, Missouri and Viroflex. This last one wins hands down for texture, flavour and on frost-resistance too! This is now the fifth year I've grown it. I was delighted with it last year especially the later crop in the polytunnel - which went on cropping far longer than any of the others - well into April. In fact I had to take it out before it was finished as I needed it's space! It's a hybrid of the old French variety Monstreux de Viroflay - and the family voted it by far the most delicious both raw and cooked. It's actually a variety specifically for autumn sowing to overwinter outside and has very large, thick, fleshy and firm leaves. The others are summer varieties which I grew for comparison, but there is a marked difference in the texture of their leaves. Compared to Viroflex they're both much thinner-leaved, not as tasty and are far more vulnerable to frost. In addition - neither of them did as well in the polytunnel last winter either - bolting up to flower much faster. Viroflex is available from organic seed producers Real Seeds in the UK. In 2012 , 2013, 2016 and 2017 we had already had - 6 deg. C suddenly at the very beginning of November. The same happened again this year - but we need a few good frosts now for the parsnips. I don't think they're ever any good until they've had a couple of decent frosts to trigger them into converting their starches into sugars. By the way - don't forget that those sugars are wrapped up in the complete package of the vegetable - with all the other nutrients and fibre - so it's a bit unfair to compare them to pure sugar as some 'low-carbers' do - especially since they contain a lot prebiotic fibre, vitamins, minerals and other important phytonutrients as well. As we don't add nutritionless 'free' sugar to anything - I think we can be allowed a few sweetly nutritious parsnips! Perhaps it seems odd to some people to be looking forward to colder weather - but the parsnips are looking so good that I can't wait to eat them! My favourite way is roasted - but parsnips are very versatile and can be used in so many different ways - even in rare cakes! They're one of the seasonal veg I would never want to be without, but they're so expensive to buy in the shops if you want organic - always about one euro per parsnip! It's the season of winter comfort food! Early red cabbage 'Red Rookie' & celeriac 'Albin' I'm not lifting any parsnips yet - but here's a photo of the new variety of celeriac I tried for the first time a couple of years ago - called Albin. Sown on 21st February again this year - it's made large, delicious roots ideal for roasting, mashing or using in winter coleslaws. The other vegetable I Iove in winter slaws or feremnts is red cabbage - and the variety pictured here is called 'Red Rookie' (Marshalls) which I wrote about earlier this year. It's the earliest variety ever bred and was ready to use in August. It has a lovely flavour and has really impressed me since, with it's ability to resist splitting after some of the heavy rain we've had. It's just gone on getting bigger instead. The two pictured here which I cut this morning weighed almost 6lbs/2.5kg each! It's definitely one I shall continue to grow from now on. It's siblings will now be cut and stored in the cold shed for winter use. 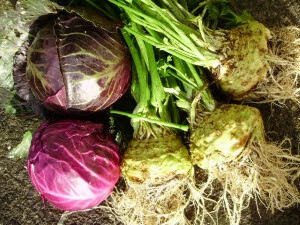 (There's a recipe for my 'Rainbow Cabbage Slaw' in the recipe section), I also use it for pickles and to make my delicious spiced, slow-cooked braised red cabbage - lovely with rich meats like goose or duck, and also, oddly, with lasagne. Funny how food tastes brings back memories - I first tasted lasagne and stewed red cabbage together many years ago at a friend's 21st - and that evening always comes to mind whenever I eat them together. It also pairs very well with roast or mashed parsnips. I've tried nearly all the F1 Hybrid parsnip varieties now - and although they are admittedly more vigorous and uniform - newer is not always better. I don't think that any have the same flavour as the old-fashioned varieties.The ultimate comfort food for me at this time of year is a huge dish of parsnips, beetroot, carrots, red onions and sweet potatoes - tossed in good olive oil with some thyme leaves and then roasted in a hot oven until they're just tender and sweetly caramelised around the edges. Irresistible - either hot or cold! A delicious guilt-free treat that can be enjoyed throughout the winter! Every time I walk past the parsnip bed now - with their broad white tops looking so promising - my mouth waters at the prospect! Roll on another good frost!! 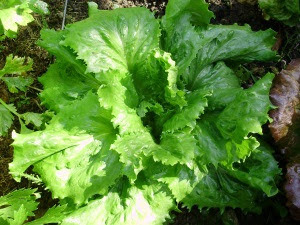 A fairly recent lettuce I've grown for 6 years now is the delicious 'Jack Ice' - again from Real Seeds (pictured here) - it's been cropping well outside all summer again. For the last few years it's also proved to be a really good winter lettuce for the tunnel. I'm growing it again in the tunnel this year. It's leaves are firm like the outside of an Iceberg and are crunchily delicious. So far it's proved to be disease-resistant as well. It has all the crispiness of the outside leaves of an iceberg - with a far better, really sweet flavour that everyone loves. It doesn't make a heart at all and goes on cropping for ages, as long as you just snap off leaves from the outside when you need them. Being green right through - it's also far more nutritious than an Iceberg lettuce and is a very good alternative for a Caesar salad if you don't have the classic crispy leaved Romaine lettuce or any Little Gem which I also like for this. It's one of my favourite lettuces now and one I shall continue to grow now. Jack Ice is definitely one for your seed orders if you like crisp lettuce like me - and can't stand those wimpy, floppy butterhead ones that wilt quickly in salads! A couple of years ago, I even experimented with transplanting quite large Jack Ice into the tunnel at this time of year from outside - with a good, big root ball. It didn't mind a bit and seemed to appreciate the shelter - so I shall do the same with any good ones still left outside now, as more frost is forecast in the next few days. You couldn't get away with doing that in the spring or they would immediately bolt - but at this time of year growth is slowing and it's not usually a problem. Far better than leaving perfectly good lettuce, with potentially several more weeks of cropping, outside at the mercy of frosts or marauding pigeons! I'm going to clear the rest of the outside lettuce in the next day or so and cover the vacated bed with soemthing to keep weeds down and stop nutrients being lost in any heavy winter rains. I'll need it early next year, so that will stop the bed getting any wetter and nutrients being lost by leaching in winter rain. If your soil is very wet after all the rain we've had lately - then don't do any planting even if you grow on raised beds like me, and don't walk on ground at all if you grow on the flat - you'll do more harm than good. The old gardener's adage that still applies is "If soil sticks to your boots - then that means it's too wet to work"! - Or even to walk on! All you will do is seriously damage the soil structure, compacting it and squashing air out. That reduces it's drainage capacity, making it much harder for plant roots to penetrate and to find the nutrients they need. Soil is a living thing - it also needs air, and protecting it's structure is just as important as protecting your plants - in fact more so. A good soil structure that contains air is vital to all the microorganisms living within it - along with nutrient and humus-rich compost and animal manures. A few years ago I was taken to task by someone quoting a particular 'expert' - who piles compost and manure onto empty veg beds, leaving it open and vulnerable to all the elements over the winter. Apparently the 'expert' was saying that "some organic people don't know what they're talking about" when they say that this leads to nutrient loss and pollution! Could the 'expert' then please explain exactly why doing this on a farm scale is now in fact illegal under EU law during the autumn and winter - precisely because of the potential risks I mention? As a former member of the Irish Organic Standards Committee - I know the Certification Panel would never give Certified Organic Status to any farmer or grower doing this - even on a small scale. Organic farmers have to be extremely careful to practise good manure management, or they could conceivably cause just as much pollution as non-organic farmers. Back gardeners and allotmenteers shouldn't be doing it either! To say that doing it on a garden scale "doesn't matter" - or "that 'well made' organic compost holds on to all it's nutrients", even when heavy rain is pouring through it, is quite frankly utter nonsense! To me the attitude 'that my/our little bit doesn't make a difference' is selfish in the extreme - and frankly often seems to me to be courting cheap popularity - at the expense of our health, that of the environment and contribute to climate change. I prefer instead to perhaps risk unpopularity by saying some things that really need to be said! 2 yr-old compost stirred into water. Five star, 2 year old mature compost. Almost edible - it smells deliciously sweet! I know it's very often difficult for some people to accept that something they may have been doing for years - and also advising others to do - could perhaps be wrong. But I have to say that such a blinkered and rather selfish 'refusal to accept reality' attitude, particularly when it applies to possible pollution, reminds me somewhat of the 1960's and the passionate advocates of the pesticide DDT! As you know it was later banned! Or again areminds me of the current glyphosate debate - and in the future I have no doubt that it will also be banned - but sadly not soon enough for the many more people whose health will be ruined by it, or the biodiversity which will undoubtedly be killed by it! Forty years ago people like me were labelled as 'organic fascists' and 'extreme nutcases' by many pro-chemical agricultural journalists and the farmers who read their columns! Now a much more enlightened Irish Farmer's Journal actually has it's very own dedicated organic section!! The climate change and antibiotic-resistance that we were also warning about over 35 years ago are sadly also now an accepted fact. Although again - we were called extremists and nutcases at the time for voicing our concerns about their overuse - especially their use as gut-microbe destroying growth promoters in livestock, purely in order to extract more profit! I hope it doesn't take as long to ban the poisonous DNA damaging EDC (endocrine disrupting) pesticides and weedkillers like Roundup/Glyphosate which I believe are responsible for many of our modern non-communicable diseases like cancer and Type 2 diabetes - but sadly it's a constant fight against vested commercial interests, corrupt politicians and sadly even many of the scientists who are in their pocket! I was actually even threatened by direct personal message on Twitter last year by one pro-GMO and pesticides scientist who I was following at the time, and who works for a seed company secretly owned by a multi-national chemical company. Although I didn't mention who he was (just saying that some scientists were for sale to the highest bidder) - I clearly touched a nerve there! Needless to say I unfollowed him after that so he was no longer able to threaten me by DM! However, time and science move on, and hopefully we also learn! Perhaps gardening 'experts' who lash on the manure think that the EU experts and concerned scientists also don't know what they're talking about? I'm not always well known for being a supporter of EU legislation - particularly when it comes to things like seed and plant patents etc. - but I wholeheartedly agree with any legislation which stops pollution or damage to human and soil health! Unfortunately the protections of EU environmental law may no longer protect the UK after the Brexit decision. The environment will then sadly be under even more threat when the UK is keen to placate the vociferous pro-chemical farming lobby and also cultivate USA trade and the large multinationals who don't give a damn about anything other than profit! Just another 'geeky' fact to back up my argument - under Irish implementation of EU wide legislation - it is actually illegal to spread manure or composts onto land after 15th October, and illegal to inject slurry after 31st October. According to the Irish farm advisory service Teagasc's expert Stephen Alexander - even in warm sunny weather, heavy gaseous ammonia (nitrogen) losses into the atmosphere can also occur - so leaving manure or compost uncovered is not actually a good idea at ANY time of year - as I've so often said! I rest my case! DON'T dig in manure and then leave ground bare over winter either, as suggested by all the old-fashioned gardening books written in another era and also those 'to do' lists copied straight out of them, by many of today's supposedly informed columnists in garden magazines!. This may seem to be the easy route to a good soil structure with frost breaking up heavy clods of clay to a fine 'tilth' - but as I've just mentioned - there is absolutely no doubt that doing this does lead to leaching of nutrients, pollution of ground water and carbon loss. It costs us all vast sums of money in taxes to clean up our drinking water and rivers etc. which are polluted by organic nutrients, as well as by agricultural chemicals such as the metaldehyde slug pellets and weedkillers etc. used in conventional farming. Ground should always be covered either by a current crop, a 'cover-crop', a green manure or even just weeds, as these will hold onto nutrients and protect the surface of the soil. Otherwise cover it with polythene, old carpet etc. - or anything that will stop rain washing through it! The worms will then do just the same job that frost and piles of manure would have done - with the added benefit that if we get a mild winter - the ground won't get covered with slug-encouraging weed growth while your back is turned! This is terribly important in Ireland with our normally mild, wetter winters. Winters everywhere seem to be getting wetter now as a consequence of climate change - and we have to change our gardening methods to take account of that - not stay stuck in a very different past! 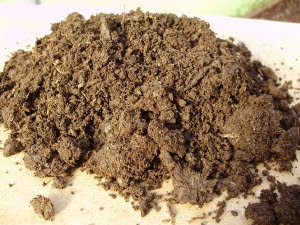 A healthy living soil - full of everything plants need to be healthy is the basis of all successful organic gardening. Take care of your soil - and your soil will then take care of your plants - ensuring that they have all the nutrients they require and as a consequence are healthy! Those healthy plants will in turn take care of you! When you're ordering seeds - buy some green manure seeds to sow after clearing summer crops next year, on any ground that may be empty and won't be needed too early in 2019. In Ireland our early spring weather can often be mild but too wet to allow the digging in of more fibrous green manures like Hungarian grazing rye early enough for them to have time to rot down sufficiently before sowing early crops, so cover ground you will need for any very early sowing or planting with a light layer of good compost, and then black polythene, which will block the light and stop weeds growing. This will keep the worms working snugly undercover all winter - leaving a perfect weed-free, nutrient-rich crumbly surface that will not require the action of frost to break it down in order to be ready for minimal cultivation - the work will all be done for you, and all you will need to do in spring is just scratch over the surface with a hand cultivator, or fork it over very lightly. My favourite garden tool is a long-handled, three-pronged cultivator that has a hoe on the reverse - I've had it for about 30 years and it's brilliant - almost the only tool I ever use. It's ideal for shallow cultivation. I've had to renew the handle quite a few times! I only use my father's lovely sharp old garden spade for planting trees now. Uncover the ground a few times over the winter on dry days - the birds will be delighted to clear up any slugs and their eggs etc, but be sure to re-cover securely again before any rain. If you have ducks you can let them in to clear up slugs too. I kept Khaki Campbells and other rare breed ducks for many years - and if I just touched a piece of polythene in the garden - the ducks would come running, quacking excitedly and all piling in almost before I'd uncovered the bed! All rushing to be the first to gorge on any slugs - their favourite gourmet food! Their next favourite is anything soft and green - like juicy lettuce. I was a bit amused to see poor Hugh Fearnley-Whittingstall losing his lettuces to the ducks that some 'expert' had advised him to get to clear up his slug problem a few years ago, on one of those River Cottage TV programmes. Anyone who's ever actually kept ducks could have told him that lettuce is what they really love to eat! I miss my ducks, they were such chatty, intelligent and sociable companions in the garden. I lost so many to the foxes though that I just couldn't bear the heartbreak any longer - particularly of losing the children's pet ones that they used to carry around under their arms. I wouldn't keep them in small pens - ducks can't bear being shut up in a small area - they pine and it's very cruel to them. I was terribly upset a few years ago to see ducks in a Bloom show garden penned into their minute pond all day - cruelly forced to swim round and round because there wasn't even room to get out to sit on any dry land at the side. They also had no plants to shade them from the blisteringly hot sun which they hate. It was torture for them, and was a disgraceful example to the public - making them think that it was the way you should keep ducks! I complained several times but was, as usual, treated like some kind of extreme nutcase. Some people seem to think that poultry are just ornaments and don't have feelings! When in reality they are highly intelligent and ducks will even answer to their individual names! Now I know some of you don't like using polythene but I've been re-using most of mine for well over 25 years, which is perfectly possible if it's a heavy grade and you put it away carefully out of the light when it's not needed, instead of leaving it lying around untidily in the garden like some I've seen! If you can't get hold of any to recycle, then silage covers can be bought relatively cheaply from farm supply shops - and are much better value than the flimsy stuff in small packs from garden centre or DIY stores, that degrades qujcikly in light, then breaks up and pollutes the environment. Get together with a few friends and buy some - it's easy to cut to the size of your beds as it comes neatly folded and then rolled up - just unroll and cut across the width of the folds - that's a neat way to cut bed sized lengths! Perhaps your local GIY group could get together and buy a roll. Make sure you cut it wider than your beds so that rain will run off and you can secure it either side with planks, blocks or something else heavy. Make sure you have plenty of fleece to enable you to always have a dry one ready to cover things if frost is forecast if you don't have cloches - which can be expensive. Wooden clothes pegs are useful too, for securing fleece to canes or wire hoops - rather than resting it on the crop. It can often be quite breezy in the evening - then the wind suddenly drops around midnight and there can be a hard frost. Plastic pegs don't work as well. A home made frame or cloche can be just as effective - but you will still need to take it off or raise it to ventilate at times - otherwise the damp cold air will cause rots very quickly in salad crops. It's not that much bother - when you think how much money you will save on buying organic lettuce - imported and minimum 3-4 days old - even if you can find it! It really lifts the spirits on a cold, grey, cheerless November day to see the vibrant colours of some of the winter salads when I walk past their bed on the way up to the tunnels every day. Continue to keep a sharp eye out for slugs and snails - checking at dusk and early morning is a good idea if you can - you'll catch most then. Keep weeds down which encourage them, and also if you have grass paths keep them clipped very closely so the slugs don't have anywhere to hide - they don't like crossing clear ground. I find putting large stones or slates on beds every so often is a very effective way to trap them - slugs will often hide under them and you can remove and dispose of them however you like! If you put down beer traps then cover them with a slanting roof of slate too - or they will get diluted with rain and be useless. Don't just retreat into the house and do nothing at this time of year - as so many people seem to do! Slugs will just keep multiplying if it's mild - and you'll have an even bigger problem next year! If you have a really serious problem - then growing salads in a raised bed with a ring of copper wire or tape around it is a good idea - this deters them. Other crops are not so vulnerable! Encourage birds into the garden by feeding them - blackbirds and thrushes love snails in particular - you can often hear the 'tap-tap' sound they make as they break snail shells using a big stone as an anvil! But don't chuck any snails over the fence into next door's garden - scientists have now proved that they have a homing instinct and will keep coming back like boomerangs! ...... But just a little bit slower! You can plant garlic now in well drained soil in a sunny spot and in raised beds or containers. November is your last chance if you want really big bulbs with nice fat cloves. Garlic is actually very hardy and most varieties in fact need a cold spell for proper root development - but the onion family hates sitting in water and will rot. The only garlic variety that I've found so far that makes equally good bulbs if planted after the New Year is 'Christo'. There may be others but I haven't found them yet. If the soil is too wet then, you can plant the cloves into individual modules or small pots - planting out later on in March. I did that this year and the 'Christo' made huge bulbs with many really big cloves. It has a good strong flavour and it's always my most reliable cropper. I tried planting 'Thermidrome' after the New Year a few years ago as an experiment, but just ended up with large single clove-less bulbs like Elephant garlic! - Many varieties will do that if not planted in the autumn. 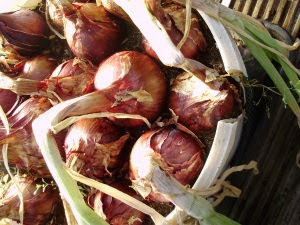 Early overwintered onion sets'Electric' made such large bulbs in this tub that it split! If you want to grow from sets to get some really early onions - then grow them in pots or containers as in the picture above. Plant the sets about 2 - 3 ins/10 cm apart - as they grow they will make their own room and make nice fat medium to large sized bulbs if they're watered regularly. That way if you're unlucky enough to get any disease - you can throw the compost into the food/greenwaste recycling bin - NOT onto the compost heap!! I plant my garlic finger deep and 1ft/30cm apart each way outside so that I can inter-crop with spring lettuce or other fast growing salads. This doesn't affect the vigour of the garlic at all and protects the soil surface. As you can see in the picture at the very beginning - I also do this with leeks. My beds are 4ft wide so I get 5 rows of garlic across - it looks neat and works well - if you plant at the recommended 7-8ins/10cm apart, there isn't really room to inter-crop, which actually protects the surface of the soil and keeps weeds down between the rows of garlic due to blocking out light. I've tried inter-cropping with carrots - but it didn't keep carrot fly down! Around here the only way is to cover carrots permanently with mesh or fleece, so I grow them separately. Stake brassicas like Brussels sprouts now to stop them rocking about in strong winds - this can create a hole which fills with water and rots roots. 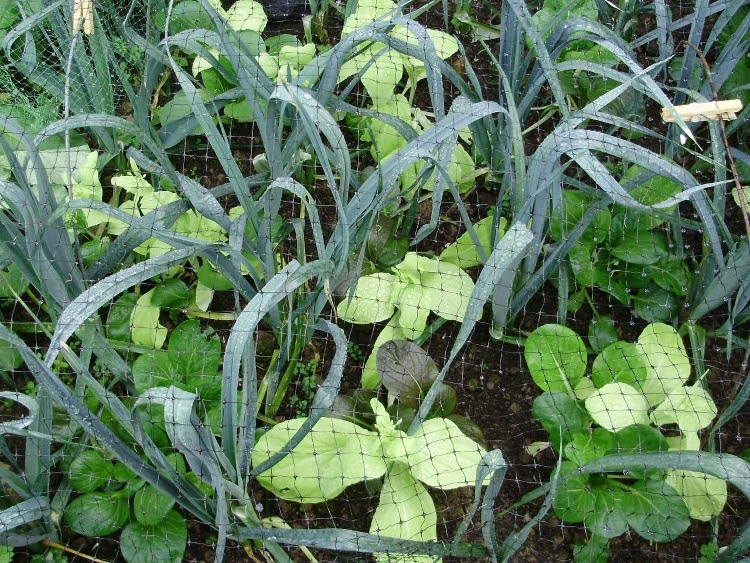 Also make sure your brassicas and lettuce are netted now to keep hungry pigeons off! Keep an eye out for grey aphids which may be a problem after the mild October - deal with them immediately and don't let them build up or they can be quite difficult to get rid of because they hide in all the crevices of Brussels sprouts and broccoli etc. Preferably give them a sharp spray with your finger over the end of the hosepipe to dislodge them - that's usually enough. They won't crawl back up and the birds will eat them - so encourage your garden birds by feeding them close to the veg. plot. Or use an organic insecticidal soap if you must. Also clear up any leaves that are yellowing or rotting - don't leave them lying around to spread disease - put them onto the compost heap or feed them to hens if you have any. Mine really appreciate the extra greens in the winter and don't mind a bit if they're less than perfect! Could someone please tell me just what's wrong with a few so-called 'weeds' in a lawn? Is there a law against daisies and dandelions - after all - they're vital food for bees, butterflies and other insect pollinators which desperately need our help! Is using lawn weedkillers to achieve a perfect grass-only surface some sort of 'control' substitute for a frustrated 'hunter gatherer' instinct? You wouldn't believe how many emails I get from people who can't persuade their partners not to use weedkillers - believe me - I know that difficulty only too well! If friends REALLY want to help you ask them to start saving you all their used yogurt pots, plastic trays, large plastic bottles for mini- cloches etc. - in fact anything which might be usefully recycled. Pots, seed trays and labels etc are very expensive and mostly unnecessary. Hang round your local veg. dept when they're refilling the shelves early on busy days - there's masses of useful stuff you can recycle - ask nicely and explain why you want boxes etc. most people are usually only too happy to help. The real prize are those deep plastic mushroom boxes, which are great for sowing carrots, etc. in loo roll middles, they're nice and deep. I also use them on the steps of my stepladder garden. The 10 litre mayonnaise and coleslaw buckets from deli. departments are also useful - great for growing tomatoes or in fact anything in! I've never had such good aubergines since I started growing them in those free buckets! This is 'Dream-time' for gardeners already looking forward to next year. It's not far away! This time of year is 'dreamtime' for gardeners. Sitting in front of a crackling log fire on a winter evening with a seed catalogue, imagining long warm summer days and abundant harvests to come is always one of my favourite occupations. I always mark far too many things though - so after I've done that - I then go through my collections of seed packets left over from this year, to make sure I'm not duplicating and also checking if any are well out of date. These days you need to order seeds fairly quickly, as the popular or new varieties often sell out by the end of January. Some people don't even think about next year's vegetable gardening until well into the New Year, when it can be too late. I've been caught out several times in the past by not ordering early enough! Another thing you can do on cold winter nights is to draw up next year's cropping plan (I use graph paper), using not less than a four course rotation. That is - making sure that no crop is grown on a particular piece of ground more than once in four years, to avoid a possible build up of disease and specific nutrient depletion. A conventional rotation would be potatoes followed by peas and beans(legumes), followed by cabbage family (brassicas), then roots. This is much easier to plan on a bed system. Outside in the kitchen garden, I use at least a five year rotation taking into account crops like sweetcorn, marrows etc. In the polytunnel it is hard to stick to four! Try to write down what was good or not this year, while it's still all fresh in your mind. If you're only just starting out on growing vegetables or fruit - don't try to take on too much - that's why most people give up. Just do one square metre really well the first year. It's amazing what you can grow in such a small area. Success will encourage you and you will learn a lot - a weedy mess may discourage you for years! Starting on a small scale also allows you to understand your plants and their individual needs better - doing this is the key to becoming a successful gardener. Order lots of seed catalogues, they're free, and full of really useful information like cropping times, space needed etc. - even if you don't buy from them. I still prefer catalogues in my hand, rather than looking online. Not only do they often have a lot more info. in them, but it's also much easier to compare prices unless you're going to spend hours writing them down! It's amazing how much the price of the same seeds can vary - some catalogues will have far more seed for less money. The first catalogues for 2019 arrived a couple of weeks ago - I always look forward to them! The same applies to seed potatoes. If you can't find the particular varieties you want here in Ireland - you can order these online from some companies in the UK now too - all with EU plant certs. If they won't send them to Ireland - then you can use Parcel Motel like I do now for many things - particularly organic nuts and other things that are often four times the price in Irish health food shops, if you can get them, than they are postage free from Amazon!! I use a Parcel Motel address in Belfast (UK) and then they transport them down here and leave them in a personalised secure locker for you at one of their depots. Tah Dah!! The seed companies start to send potatoes out in December, depending on the weather. Don't put off ordering until you feel the sap starting to rise in the spring - like a lot of gardeners do - it will be too late to get the potatoes sprouting early enough! One tip though - they all usually wait until they have the whole order together before sending - so if you haven't saved tubers from your spring-planted first earlies and want to get a variety to do my 'extra-early' planting in order to have new potatoes for Easter - then order the early variety separately to any maincrops, as that seed often doesn't come into the suppliers from the seed-potato growers until later - and then it may be too late to get any really earlies in. I get around this by saving a few of my best 'extra earlies' to use as seed the following year, as I've mentioned before. I've often planted them a couple of days after Christmas some years - and you'll be lucky to see seed potatoes for sale anywhere here until at least late Feb. or March. My standard 'wouldn't be without' earlies are usually Apache, Red Duke of York, and Lady Christl (which is the earliest to bulk up - I will be cropping these in the polytunnel in mid-April from a mid-January planting) The last few years I've also grown Mayan Gold as an 'extra early' - we were eating them only a week after the Lady Christl in mid-April this year! If you're doing an autumn pH test before possible liming - don't lime where you will be growing potatoes next year - it can cause potato scab. They prefer a slightly acid soil. Calcified seaweed or dolomite lime are preferable and more slow release than ordinary garden lime bought from garden centres. They also add other valuable minerals and trace elements. Adding lime to soil every year as a matter of course, as some gardeners do can eventually lead to an excess of calcium building up in the soil. This can cause 'chlorosis' - when nutrients become 'locked up' and unavailable to plants because of too high a pH. 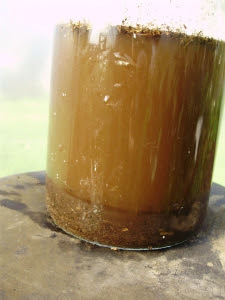 A soil test is well worth doing and a cheap test kit for pH can be bought in any garden centre or DIY shop these days. Too little lime (calcium) in the soil and a low pH discourages earthworms and actually encourages the dreaded, earthworm-devouring New Zealand flatworm which prefers an acid soil - which you do not want! I enjoy sharing my original ideas and experience of growing and cooking my own organic food with you. It's most satisfying and also complimentary that others find "inspiration" in my work. If you do happen to use it or repeat it in any way - I would appreciate very much if you mention that it came from me. Thank you. Happy gardening and happy dreaming!